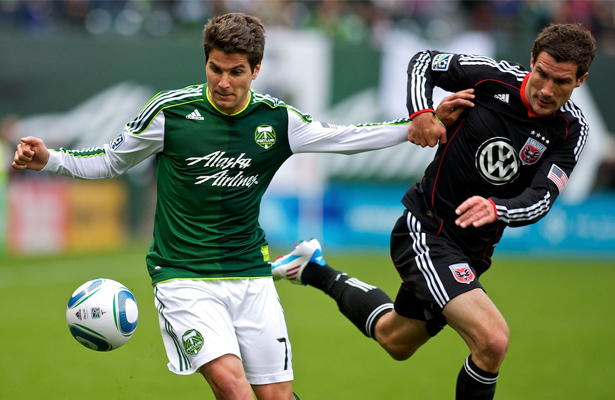 The Portland Timbers are at home against DC United next Saturday. United finished 2013 with the worst season record of any team in the history of the league. So it was no suprise when coach Ben Olsen cleaned house in the off season. Lionard Pajoy, Dwayne De Rosario and the ever unpopular Carlos Ruiz were part of a group of eight players who had their options declined. Altogether, 16 players left the club, (though Ruiz & Pajoy left during the season). So with all of that roster space, DC United went about assembling a fairly decent squad. Picking up Davy Arnaud from Montreal, Sean Franklin from LA, Bobby Boswell from Houston, Eddie Johnson from Seattle, Fabian Espindola from New York & Chris Rolfe from Chicago. In total, 14 new faces came in and the result has been surprisingly good. DC are currently sitting in 3rd place in the eastern conference. They suffered in the early rounds of the season, mostly due to new players trying to learn to play together. But they have settled of late. Eddie Johnson hasn’t found his scoring touch yet, but Fabian Espindola is on fire. With four goals, and three assists, the Argentinian is one of the most productive players in the league. He is normally played as a forward, but he regularly drops back into the midfield channels to collect the ball, from where he creates chances. Will Johnson was his former teammate at RSL, and will need to keep Espindola quiet. Chris Rolfe & Davy Arnaud have been employed in the center of midfield, dragging the defenders out of position and freeing up space for the forwards to run into. Perry Kitchen has been playing a sweeper roll in front of the centre backs to great effect. Kitchen has been played almost every game for DC since the start of the 2011 season. He’s had to put up with a lot considering the form of the team, so it’s good to see him finally playing with players as committed as he is. Had a 22 year-old been a consistent starter for any other team in the league over the past four years, surely there’d be talk of international caps. Perhaps those days are still ahead of him. At the back, Bobby Boswell and former Philly player Jeff Park are sitting infront of Bill Hamid, and provide a very experienced centre of defense. With Sean Franklin playing outwide, DC have put together a well balanced spine of a team. 2013 wasn’t all bad for DC United. They won the US Open Cup, earning more wins than in their entire MLS season. And while 2014 is already far more successful than last year, DC have struggled to find the net on the road. With only one away goal coming against Columbus in a 1-1 draw, the Timbers shouldn’t fear DC’s road form. However, with Eddie Johnson well known to most Timbers fans, the US Men’s National Team player and former Sounder would love to open his 2014 account against his old foe in Portland.